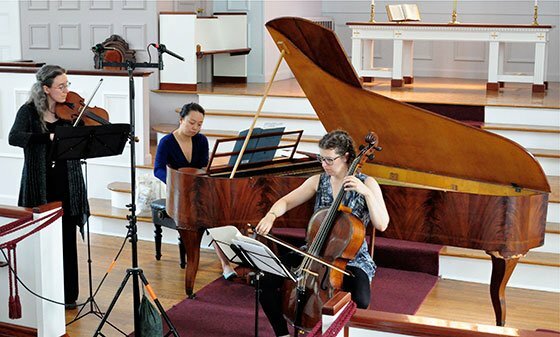 Sunday afternoon in the Ashburnham Community Church, Boston-based violist and Baroque violinist Sarah Darling, Belmont native, currently Leeds, UK (where she is pursuing a Ph.D. in 19th-century performance practice under Clive Brown)-based cellist Kate Haynes, and now NYC-based pianist Yi-heng Yang offered a program of music by Ludwig van Beethoven and Felix Mendelssohn. They have been playing together since 2000, and have recently christened their collaboration the Davidsbund Piano Trio, implying a focus on pre-1860 repertoire and performance technique; Yang said in a comment after the pause that it was Darling and Haynes who urged her to explore earlier pianos, which have now become a major portion of her career; she appeared in June on the BEMF fringe Beethoven program [here]. It was Darling’s first appearance on the Frederick Collection’s series, Haynes, second [Her first is reviewed here, and Yang’s fourth. Darling plays an anonymous French violin with a bow by Louis Begin and performs standing; Haynes plays a 1753 cello made in Paris by German luthier Johannes Matthias Wolters, which she plays in gamba manner, between her calves and without a stick, using a modern copy of a Classical era bow made by Gerhard Landwehr in the Netherlands; and Yang selected the 1830 Johann Nepomuk Tröndlin piano from the Collection. You can read about it and its maker and his company in a 2010 review [here]; it was Mendelssohn’s preferred make, and he put Tröndlins in the Gewandhaus when he was in charge there, where the make remained the house piano into the early 1860s. The trio opened with Beethoven’s Variations in G Major on “Ich bin der Schneider Kakadu” from Wenzel Muller’s 1794 Die Schwester von Prag, Op. 121 a composed in 1803 and revised in 1816. The uncannily beautiful and perfect blend of the sounds of the three instruments became immediately apparent as did the uncanny ensemble of the three musicians. This set of variations offers variety, in addition to that of the genre’s inherent diverse handlings of the base theme, in the form of solo moments for the piano, occasional brief ones for each of the string instruments, and a longer string duet passage with the composer’s own instrument remaining silent. Beethoven had been dead for three years when this instrument, which has no metal structural components, was made, and never heard the sound of instruments like it in this stage of the piano’s development because of his hearing impairment, but it suits his music especially well. The other work on the first half was Mendelssohn’s infrequently heard Cello sonata No. 1 in B-flat Major, Op. 45, composed in October 1838, when this piano was eight years old and the composer 29. For this, Haynes opened her iPad, commenting that it is now possible to find original editions of scores on line and use them in performance. The performance was sublime, eliciting shouts of “Bravo”, double-thumbs-up signals, and rising to their feet from numerous members of the audience; I overheard a listener say “That piano is wonderful!” when the applause died down. The second half was devoted entirely to Beethoven’s Trio No. 7 in B-flat Major, Op. 97, “Archduke,” written in 1810-1811 – note the continuation of mood with the preceding piece due to the shared key signature. The performance attained for me the summit of early-instrument, historically informed-performance recitals. It was not only the best “Archduke” that I have ever heard, but also the most beautiful because of the perfect blend and harmony of the colors, tones, and textures of the sounds of the instruments and the perfect partnership of the musicians with unbelievably fine balance, nuances, and control of dynamics in their playing. The opening Andante cantabile of the third movement was achingly gorgeous. The entire audience was completely enraptured, as if holding its breath, and immediately on its feet at the conclusion. The Trio rewarded the audience’s appreciation and enthusiasm with an encore: the Nocturne from Mendelssohn’s Midsummer Night’s Dream, Op. 61, composed in 1842, as transcribed for piano trio ca. 1875 by Renaud de Vilbec (1829-1889); its exquisite, quiet beauty brought the audience to its feet yet again. Some in the audience were regular attendees; others were newcomers. After the recital, I overheard a listener describe the sound of the notes of the piano as “pearls, if pearls could be sounds”; another described the recital as a whole as a “finely woven tapestry of colors, textures, and tones.” The whole came as close to perfection as one can get. It would be wonderful if the Davidsbund Trio would record the Archduke and the two Mendelssohn ’cello sonatas (Haynes and Yang played the second with the same instruments in their earlier appearance here.) with this piano, since it has not yet been used in a recording, nor do any of the few period instrument recordings of the latter use a Tröndlin (there are only about a dozen left, and not all are in playing condition), whose soundscape is likely the one the composer had in his head when writing. The Tröndlin will be in the sanctuary again for next Sunday’s recital, also featuring Beethoven and Mendelssohn with Schubert in addition. Marvin J. Ward, a retired translator and teacher of French (Ph.D., UNC Chapel Hill), has been writing for Classical Voice of North Carolina for a decade and was founding Executive Editor of Classical Voice of New England through December, 2009. He is now a Five Colleges Associate based at Smith College.